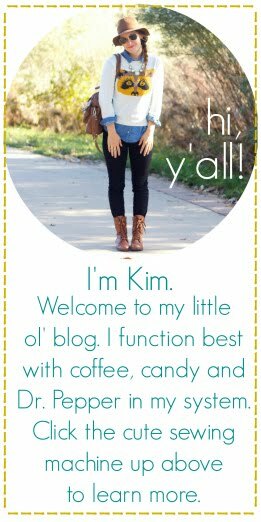 I'm linking up with Lindsay today over at the Pleated Poppy for What I Wore Wednesday! This morning I'm teaching a sewing camp. Then, I'm grabbing lunch with a friend. After that, I go straight to work. My outfit needs to be fun, mobile, comfortable, and ready for work at Anthro. Rising Sun Post Earrings: Urban Outfitters. I branched out and bought colored denim. I'm actually excited about this trend because it makes me have fun with my wardrobe & we're hearing it will be coming back in the spring. I usually don't jump on "loud" trend like these, but whatever. gasp. I'm branching out from my earth tones! These stevies are SO. dang. comfortable. I also call them my "hot pants," which keeps me from taking myself too seriously. I'm wearing borderline coral pants, after all. Yikes. Have you bought anything to wear that's WAY outside of your comfort zone lately? Happy Hump Day! I can see the weekend over the horizon! I LOVE those pants! I really can't wait to lose this baby weight to buy a pair of colored jeans. I love this trend! I also have that leather crossbody in teal. Love it! I've wanted to try some colored denim for a while now, but I'm scared! love love love this outfit! especially the jeans! I have been trying to buy more clothes that are bright and could be layered... it takes a while to transform a wardrobe without emptying your bank account! 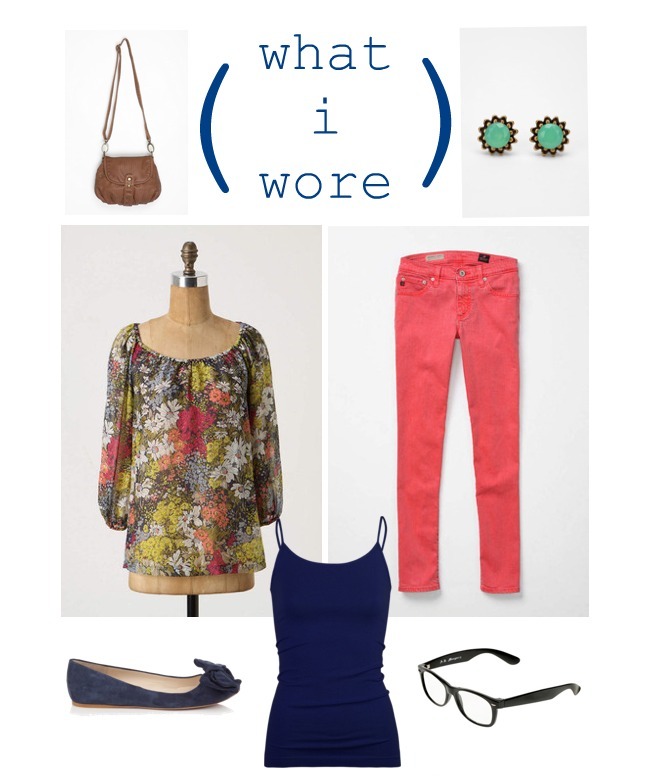 This look is adorable, and I love you foray into colored denim-I think I need to give it a shot! LOVE the accessories! cute outfit. i actually bought a pair of salmon-colored cords on sale at anthro in the winter. they are definitely a bit outside of my comfort zone, bit i love them! CUTE, I love the accessories! but man, i'm totally jealous of those colored denim. i have yet to find a pair that i like - loving those for sure! Hey there, thanks for coming by for a visit to She's Crafty. I am in love with coral and blue...great choices in this outfit. I like the color of the earrings and the fact that they don't MATCH, but they GO. I have to get better at that idea. Being a mom doesn't mean you have to lose yourself or your style. i'm a very young 31 and still have many plans to stay cool as I add on the years. nothing to be scared of girlfriend. in my opinion, to completely lose yourself in your kids is just as unhealthy as the opposite. keep up the cool girl! I want top. So cute!